Even though they’ve become as common and as popular as hamburgers and French fries, a lot of us really don’t know that much about latte and cappuccino. Surprisingly, many dedicated coffee drinkers have a hard time telling the two popular Italian hot beverages apart. Despite the confusion, such gourmet coffees are fast growing in popularity throughout the United States. A 2013 survey by the National Coffee Association USA discovered that 31% of coffee drinkers now consume gourmet varieties on a regular basis. The same survey found that the percentage of people that drink traditional American-style coffee has fallen from 56% to 49% in the past few years. So what is the difference between a cappuccino and a latte anyway, and what makes these sweet caffeinated drinks so popular? After all, both drinks are of Italian origin, and both are prepared with steamed or textured milk. The truth is that the differences are greater than that, beginning with their origins. Latte is actually an English word that is a shortened version of the Italian words caffe latte or caffelatte, which mean “milk coffee.” Milk coffee has been consumed in Italy for centuries, but what we think of as lattes are a modern invention. The American latte may have been invented in Berkley, California, in the 1950s by restaurant owner Lino Meiorin. The public began to notice the drink in Seattle in the 1980s when the modern coffee shop craze began. Today lattes have become a fixture of American life largely due to the phenomenal success of Starbucks. The latte usually served in the United States is a mixture of steamed milk and espresso coffee. The Italian version is merely a mixture of hot milk and coffee prepared at home. In America, lattes are usually a coffee house drink, but in Italy they are drank at home, usually with breakfast. Cappuccino actually originated in Austria in the early 19thcentury, where it was called Kapuziner, which meant a coffee drink that contained coffee, cream, spices, and sugar. Cappuccino is simply the Italian term for Kapuziner, so the idea that the drink was named after the capuchin monks is not true. What we think of as the cappuccino originated in Milan in 1901 when Luigi Bezzera invented the expresso machine, which soon became standard equipment in Europe’s cafes. The modern cappuccino evolved from a mixture of steamed milk and coffee that appeared in Northern Italy in the late 1930s. Cappuccinos became popular in Italy after World War II when the age of crema (cream), which was ushered in by the introduction of new coffee makers, began and expresso bars became part of the landscape. The age of crema reached America in the 1980s with the popularity of chain coffee shops such as Starbucks. Unlike a cappuccino, a latte can be made from any kind of coffee. Interestingly, a latte does not even have to contain coffee: the drink can also be made with tea, matte, matcha, or even cocoa. The standard American latte usually contains one-third espresso, two-thirds steamed milk, and a layer of milk foam on top. In contrast, a traditional Italian latte usually doesn’t contain foamed milk. A cappuccino is always made from an espresso blend coffee, hot milk, and steamed milk. A wide variety of other ingredients, including spices, flavorings such as sugar and, even fruit or protein are often added to cappuccinos. A traditional cappuccino usually has a two-centimeter-thick layer of foam on top. Cappuccinos are usually made with steamed milk from an espresso machine. 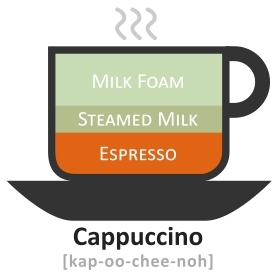 Lattes can use either hot or steamed milk. Many Italian households use a special coffee pot Moka or caffettiera to make lattes at home. Americano – A single shot of espresso mixed with a cup of hot water. The name comes from American tourists and GIs (soldiers) who thought Italian coffee was too strong and wanted it diluted. Many coffee drinkers prefer Americano because it is not as strong. The traditional formula uses less milk, but varieties with a lot of milk are around. 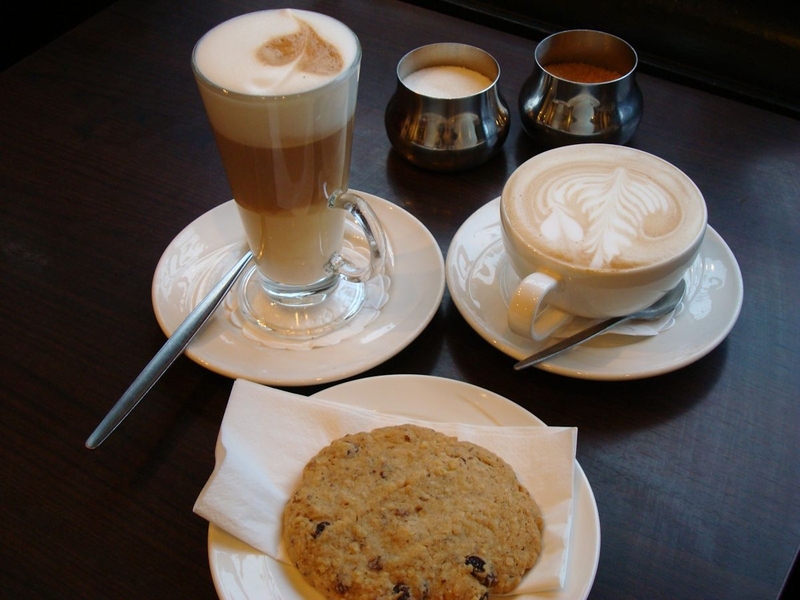 Cafe au Lait – This is the French version of a latte traditionally served in Paris cafes. It was traditionally made with half milk and half espresso, making it weaker than its Italian cousin. 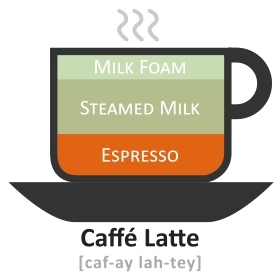 In Scandinavia, the terms Café au Lait and Caffé Latte are used to describe this drink. Cafe Mocha (Mochachino) – Simply a cappuccino or a café latte to which cocoa powder, grated chocolate, or chocolate syrup has been added. There is no standard recipe, so ingredients and mixture vary widely between coffee houses. Caramel Macchiato – A cappuccino that contains caramel syrup as well as foamed milk. Vanilla is often added to it to provide extra flavor. It is usually extremely sweet. To add to the sweetness, caramel sauce is often poured over the foam. Irish Coffee – This drink is actually a cocktail made from hot coffee, Irish whiskey, and sugar, topped with thick cream. In recent years espresso and café Americano have been substituted for the coffee to create a different drink. Caffe Corretto – A drink that contains a shot of espresso and steamed milk mixed with brandy, grappa, Sambuca, or cognac. It can also refer to a cappuccino or latte to which one of those beverages is added. These are just a few of the many coffee beverages out there. The variety of coffee drinks in today’s world is incredible, and it keeps growing.